I'm so excited to be accepted to college and as a result, I have started dorm shopping! I'm going with the color scheme of kelly green, navy, and white with gold accents. I wanted to show you guys the things that I have gotten so far. There will be lots of these posts to follow and probably a complete video haul once I get everything, so fair warning this is the first of many. I have gotten my bedding, some desk accessories, and some other room decor. This is the bedding I got. It is the Peyton Duvet Cover in Kelly Green from PB Teen. I also got the pillowcases to match. I'm not planning on opening the packaging until I get to school, because I know once I open it I won't be able to get it back to the size it came so please excuse that I had to use the stock photo from PB Teen's website. I love this bedding; the color is perfect and I love the pattern! Plus I wanted colored bedding so if I get something on it, it won't be as noticeable as if I had white. I want my desk accessories to be gold and acrylic, so any gold desk accessories that I have seen I have bought. 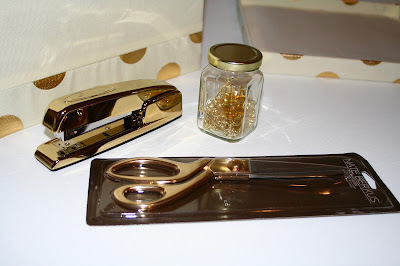 I think my desk is going to look so cute and these items are perfect to help studying seem a little bit more fun. I can't wait to use them! I have gotten a few other gold items that I am going to use as decor. I am planning to use the jar for my makeup brushes. 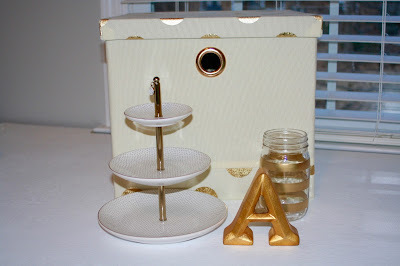 I thought the gold bin would be great for storage under my bed and the catch-all tray will be great to keep my everyday jewelry and other knick knacks. I think the gold letter will be super cute either on a gallery wall or just on my desk! Catch All Tray: Target-Can't find it online, but I got it recently so you should be able to find it in store. Gold Bin: Home Goods-Not available online, but I got it recently so you should be able to find it in store. Gold Letter: Kirklands-Can't find it online, but I got it recently so you should be able to find it in store. I know there are still like 7 months until I go to college, but I'm trying to buy things slowly so I don't end up spending hundreds of dollars at once. I'm not using this stuff until I go to college so I've just been resisting the urge to put it all out in my room right now. I hope you guys enjoyed this post and look forward to many of these posts in the future!